How much do you know about magic? It’s time to see through the illusion! The Magic! exhibit is now open at HMNS. Throughout the run of the exhibit, check back here for exclusive videos and descriptions of the unique items on display from curator Scott Cervine. These 20th Century Wooden Cups by the Indian maker D. A. Tayade are based on an ancient, traditional design. Unlike the traditional conical Western cups, these do not stack and the knob on top is used to lift and manipulate the cups. 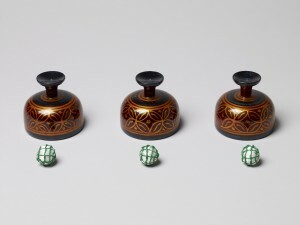 Despite the technical differences, the structure of such routines is similar in that small cork balls appear, vanish and transpose between the cups, ultimately leading to the surprising revelation of something other than small balls (larger balls or fruit) under the cups. The traditional Indian performers, known in Hindi as “Jadoo Wallah,” perform the cups seated on the ground, rather than sitting at or standing behind a table. See Richard Hatch’s version of this classic illusion in the video below; Richard also performs live in the exhibit on certain days. Click here for the schedule. Scott Cervine, guest curator for Magic: The Science of Wonder, was one of the youngest people ever accepted by the prestigious Magic Castle in Hollywood – at age 15. By the time he was 21, Scott was accepted as a full-fledged member of the Academy of Magical Arts. He is the only magician to ever be named “Magic Entertainer of the Year” two years in a row. Scott has appeared on several new shows, blending his unique style of comedy and magic to dazzle audiences. He has performed in over a dozen countries and made several TV and movie appearances. Next Post Rev. Butter Turns Up the Heat at Big Bite Nite April 29!